Did the title catch your attention, probably yes! Like how the new colourway of the Jordan CP3 IV intrigued a lot of Jordan shoe lovers! 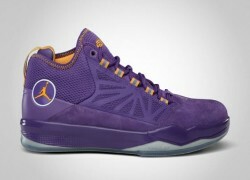 The Varsity Purple/Sunstone-White edition of the Jordan CP3 IV is set to be released this month and it will definitely be an instant hot item in the market because of its attractive colourways, color combination that would probably make you think that CP3 is already a member of the Lakers. But No! The colourway has nothing to do with the trade rumors surrounding the superstar point guard, but his fourth signature shoe is expected to hit strides again like the previous releases of Jordan CP3 IV, which would probably be Chris Paul’s shoe in the 2011 All-Star Game in Los Angeles. Watch out for it this month!